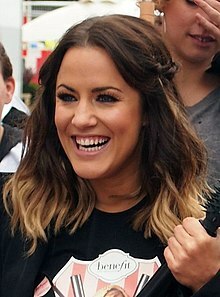 Caroline Louise Flack (born 9 November 1979) is an Inglis televeesion presenter, radio presenter an model, that's career begoud whan she starned in Bo' Selecta! in 2002, but that haes syne gane on tae present various ITV2 spin-aff shaws sic as I'm a Celebrity...Get Me Out of Here! NOW! frae 2009 till 2010 an The Xtra Factor frae 2011 till 2013, the latter wi Olly Murs (2011-2012) an Matt Richardson (2013). ↑ "Caroline Flack". FHM. Archived frae the oreeginal on 10 November 2011. Retrieved 17 November 2011. This page wis last eeditit on 9 November 2018, at 17:26.